Orejas, also known as palmiers, are a puff pastry cookie and kind of pan dulce commonly found in panaderías all over Mexico. Pan dulce was made popular during the French occupation in the mid 1800s, and as Mexican President Porfirio Díaz was considered to be a Francophile, French influence on Mexico’s gastronomy was allowed to grow from the time Díaz first took control as president in 1880 and flourish into the early 1900s. In 1911, Díaz left Mexico to live in exile in Paris when Madero became president; he would live there for four years before he died in 1915. 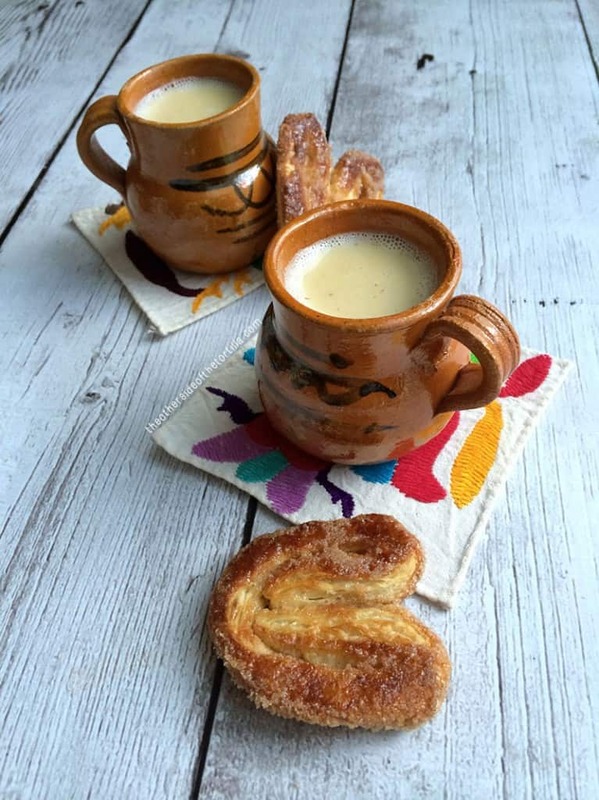 And although Díaz died in exile, the French pastries and sweet breads adopted by Mexico morphed into uniquely Mexican creations, with a variety of shapes, textures and creative names that still exist today. Pan dulce can encompass pastries, sweet breads and even cookies. Other popular kinds of pan dulce include conchas (circular sweet rolls with a sugary, crunchy, crumbly topping made of flour, confectioners’ sugar and butter or vegetable shortening, and shaped to resemble a seashell), sweet empanadas, mantecadas (similar to pound cake, and shaped like muffins or mini loaves), cuernitos (croissants), and puerquitos or marranitos (pig-shaped cookies). Of course, these are only a few of the most popular and common kinds of pan dulce. Some types have a directly translated name from the original French name, but others have more creative names in Spanish. Orejas are a staple at my house and I often make a batch to enjoy with a cup of coffee throughout the week, to take to work for a breakfast meeting, or when I need to drop off something easy for a bake sale or party. Some of my other favorite variations include churros, garibaldi, and rieles (mini strudels with a fruit or cheese filling and coarse-grain sanding sugar). 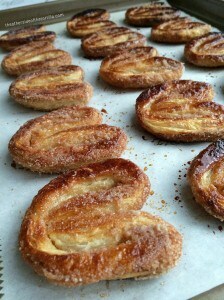 Orejas are made by spreading cinnamon sugar on both sides of a sheet of puff pastry, then rolling the puff pastry with a rolling pin to press the cinnamon sugar into the pastry. Then, the pastry is folded and sliced, and baked at a high temperature so the sugar caramelizes and creates a sort of glassy sugar glaze on the pastry dough. Although every Mexican panadería is a little different, it’s guaranteed you’ll always find orejas. But you’ll feel like a fancy pastry chef and a little bit like a rock star when you make them on your own—and you’re likely to impress people who have no idea how easy they are to make! One of Mexico's most popular kinds of pan dulce. Line a large cutting board with parchment paper and unfold the puff pastry sheet to defrost for about 45 minutes to an hour. 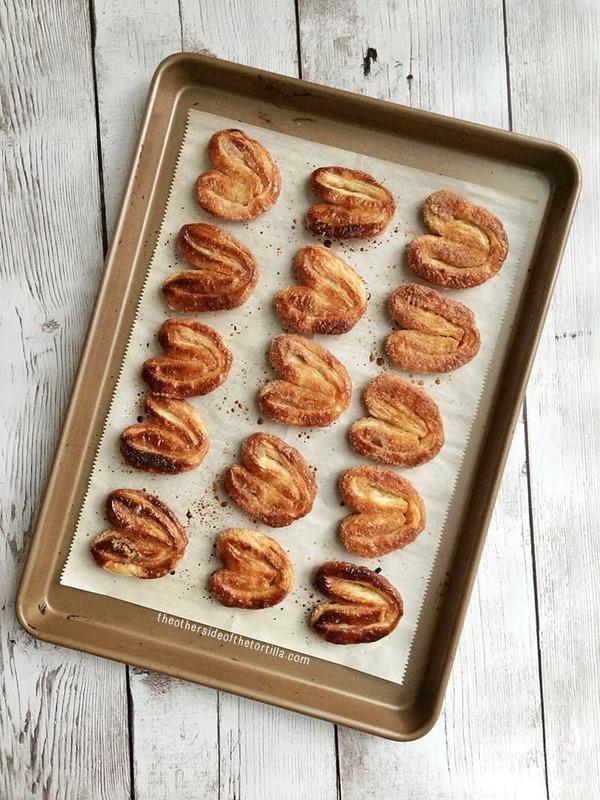 When pastry is defrosted, preheat the oven to 425 degrees F.
Line a baking sheet with parchment paper and spread about ¼ cup of the cinnamon sugar mixture on it, roughly in the shape of the puff pastry. Transfer the defrosted puff pastry to the baking sheet on top of the cinnamon sugar and peel the parchment paper off the other side. Spread the remaining ¼ cup of cinnamon sugar liberally over the top of the puff pastry. Use a rolling pin to gently roll out the puff pastry both horizontally and vertically, which will cement the sugar into the pastry. 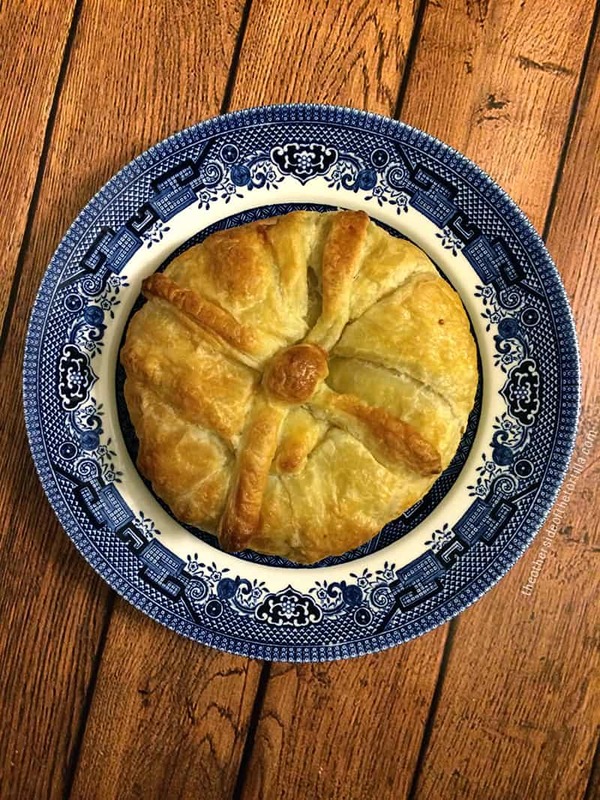 Fold the puff pastry inward from the edges to meet in the middle. Then fold again, in half. With a sharp knife, cut half-inch slices and transfer to a parchment paper-lined baking sheet. Bake at 425 degrees F for 5-7 minutes on one side, remove from oven and flip orejas with a spatula, and bake for another 3-4 minutes. Remove from oven and allow to cool on a cooling rack. Store leftovers in an airtight container for up to 5 days. Recipe prep and cook time does NOT include 45-60 minutes of inactive prep to defrost frozen puff pastry sheets.